"A collaboration of cabin experts has developed an idea that they believe could reduce boarding and deplaning times on a B737-800 by five minutes. The premise is simple: by doubling the aisle width from 16in to 32in, sufficient space will be created for passengers to move past as others stow baggage, and for wheelchairs to access the aisle easily, all contributing to passengers being seated in less time. The solution is also fairly simple: the extra aisle width is created by 'compressing' all three places in a seat triple by around 2.6in. The discomfort of the narrowed seat is only temporary, as once boarding is completed, when crew are checking the backrest and table positions prior to take-off, they press a button on the aisle seat, which activates a mechanical actuation system, expanding the seats to their full width and latching them into place. Should any passengers not fit within the narrowed seats, their seats could be expanded earlier. After landing, the aisle-sidse passengers can push the button to release the latches, narrowing the seats for deplaning. 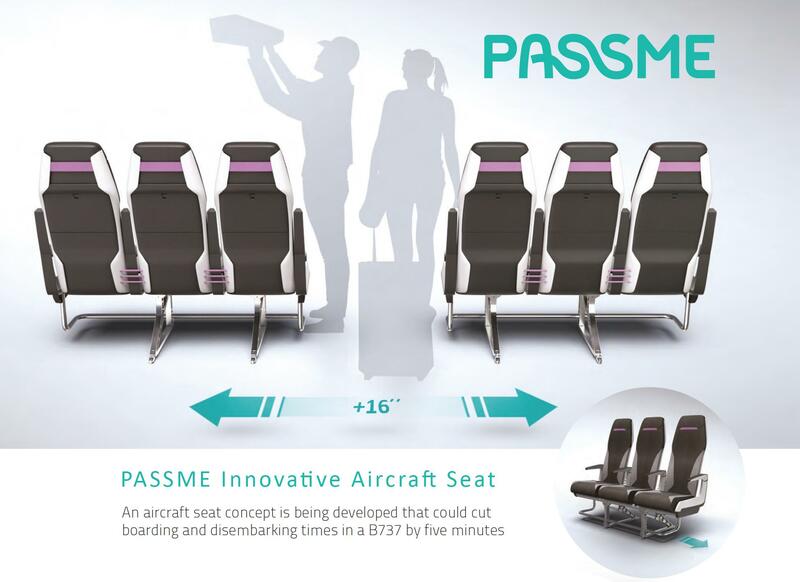 The seat has been devised as part of the PASSME project (Personalised Airport Systems for Seamless Mobility and Experience), a project aiming to address the ancipated increase in demand for commercial flights in Europe by 2050. Optimares is developing the primary seat structure, with Almadesign working on the styling of the seat, DLR providing simulation, and TU Delft also working on testing and development. The partners believe the seat design is viable and they are currently going through the patent process. Indeed the mechanical actuation system uses standard components already used in the seating industry and adds only a 5% weight penalty, which could be offset by the operational benefits. The partners do not anticipate any major certification issues as the system is only deployed when the aircraft is stationery, and it has been designed in accordance with FAA/EASA regulations. A prototype of the seat has been tested at TU Delft's labs within a mock-up B737-800 fuselage, and the partners report that the results matched their simulations, indicating a five-minute reduction in turnaround time for a standard single-class configuration with 180 passengers."